The first question I was asked when I arrived at the National Students Leadership Forum 2016 was ‘What are your expectations?’, and going into the forum not knowing what it would be like, I said I didn’t have any. Just before I left the forum I was asked ‘How did this forum compare to your expectations?’ and I can honestly say that not only did NSLF exceed my expectations but I don’t think there would be any of opportunity in my life where I could explore the notions of leadership in the community and within myself as intricately as was done within these four days. For me, NSLF 2016 started when I stepped onto the bus at 5am from Central station where I met a group of ten other delegates heading to the forum. 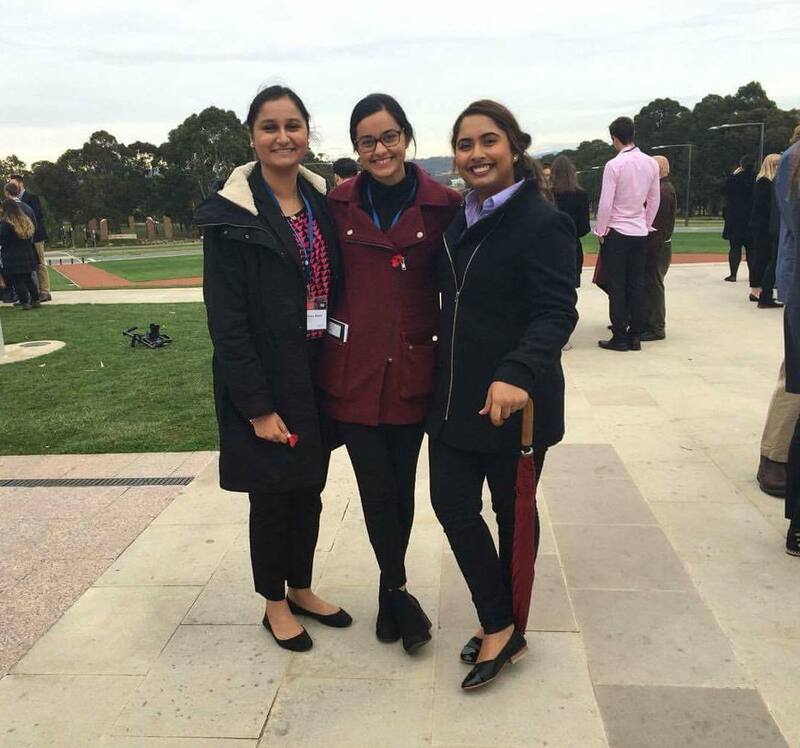 Chatting about how we thought this experience would be great to write on our resumes, build our public speaking skills and network; we were all very eager to get to Canberra and meet politicians who would hopefully change our views about leadership on a national level. Little did we know that NSLF would an overwhelming experience of strength, vulnerability, team work and support. For the duration of the forum we were put into groups of eight who would become our ‘family’. Sharing your personal life story and finding your strengths and weaknesses with these people who you didn’t know a mere 24 hours ago was both exhilarating and exhausting. This process, I would say, is just like peeling an onion. Going beneath the skin of who you really are can sting and make your eyes tingle a little bit but it is those layers and the core of you that really makes difference to who you are and what you want to become. People can dice, slice and take away certain part of you in any way they want to but at the end of the day you were and always will be one whole onion. We explored how there are different challenges in everyone’s daily life and the roles that faith and values play in our morals and decisions. It is extremely hard to put into words the emotional vulnerability and journey you undergo when sharing your story at NSLF. The ‘safe space’ created within your group at NSLF is like no other where you don’t look for sympathy or guidance after sharing your story but instead gain empowerment and understanding of who you really are and what you are capable of. Being the only Sikh in my group and one of the only three Sikhs at the forum my story shed light of what it is like to be a Sikh in Australia and also the role Sikh Youth Australia has played in my life. Along the course of these four days we heard inspirational talks from Prime Minister; The Hon Malcom Turnbull who addressed us on themes such as love within family as the bedrock of good leadership, Leader of the Opposition; Bill Shorten who affirms the values and faith he has that leads him to fight for what he believes in as a leader and a representative, Dr Stuart Bade, The Hon Scott Morrison and The Hon Jason Clare who delivered a powerful address on sacrifice, leadership and courage. As well as keynotes speakers such as Geraldine Doogue and Sen Scott Buchholz who both talked strongly on leadership potentials and seizing career opportunities. Personally, my favourite speaker from the entire forum was Deng Adut, who can be seen on the advertisement for the University of Western Sydney. Mr. Adut is a true inspiration and someone I will look up to for many years to come, his story is one unlike many others I have ever heard in its uniqueness and his strength and guidance will pave a way for generations to come. Deng went from being a brainwashed child soldier in Ethiopia, being smuggled out of Sudan and finally becoming a very successful lawyer, making a substantial difference in the Sydney’s Western Suburbs. It is Mr Adut who I hope many young adults in my generation will look up to; to help others in poorer nations and themselves to strive to become like him. I was told going into these four days that NSLF would be an experience of a lifetime and I can’t think of any other words that describe the four days I spent in Canberra more perfectly. From playing volleyball in torrential rain, trying my hardest to not whip out bhangra moves while everyone else was line dancing at the barn yard dance, sitting in on question time at the Senate, gardening for the local church or the endless hours of laughter and tears I had with my NSLF family; I can honestly say that the National Students Leadership Forum has impacted my life in ways I will never forget. Thank you to everyone who made this journey a journey of a lifetime.